This number again poses the problem of what is an original. K. E. Harvis and J. M. Black wrote the "original" in 1890, but J. B. Coats rewrote the song and published it for the first time in 1940 in a collection entitled, "Golden Key" as "Where Could I Go?" 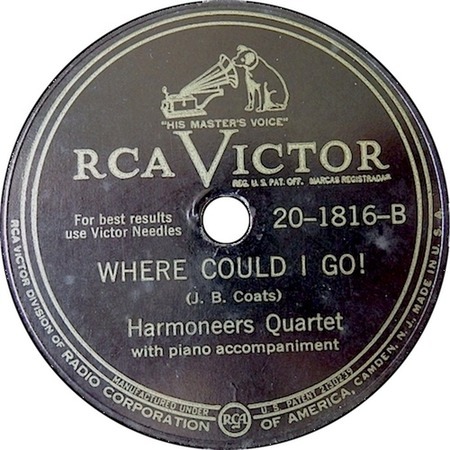 The Harmoneers Quartet recorded the original version of this gospel number on 27 November, 1945 and their recording was released as the B-side of a single on RCA Victor 20-1816, under the title, "Where Could I Go!" (note the exclamation mark in place of the question mark). Southern gospel pioneers the Harmoneers Quartet were formed in Knoxville, Tennessee, in 1943 by Fred C. Maples and Charles Key. The Harmoneers Quartet recorded primarily for RCA Victor from 1945 until 1952, though during the war years they also made a number of recordings for the Quartet label, under the name of the Maple Leaf Quartet. The career of the group spanned over four decades and numerous record labels.